Did you know that inside industrial hatcheries, eggs are routinely injected with small amounts of an antibiotic used to treat a myriad of bacterial infections? Well, the practice is allowed in organic production, too, and could lead to the occurrence of superbugs in the future, according to a new Consumer Reports study republished in Mothers Jones. For decades, the poultry industry vaccinated chicken embryos in order to prevent Marek’s disease, a common, deadly herpes virus attacking chickens, John Glisson, a veterinarian with the U.S. Poultry & Egg Association, recently told Mother Jones. But although this reliance on antibiotics has declined in recent years, it remains a common enough practice — even with our healthy farm food — because of loopholes in organic code forbidding the use of antibiotics in animals. Standards kick in on “the second day of life” for chicks consigned to organic poultry farms. But as it turns out, boosting chickens actually helps bacteria to resist antibiotics over time, according to the study by Consumer Reports, a product review magazine. Around half of every 300 raw chicken breasts purchased in U.S. stores were shown to contain at least one type of bacteria that was resistant to three or more leading antibiotics. The prevalence of this antibiotic-resistant bacteria — or superbugs — particularly alarms Consumer Reports because they cause at least 23,000 deaths in the U.S. every year. And superbug outbreaks are often more severe than those related to regular bacteria. For instance, a salmonella outbreak linked to Foster Farms — America’s sixth-biggest chicken producer — sickened 416 people this past year, according to Consumer Reports. “At the moment, the only way to protect yourself from becoming sick is to remain vigilant about safe handling and cooking,” Dr. Urvashi Rangan told Mother Jones. 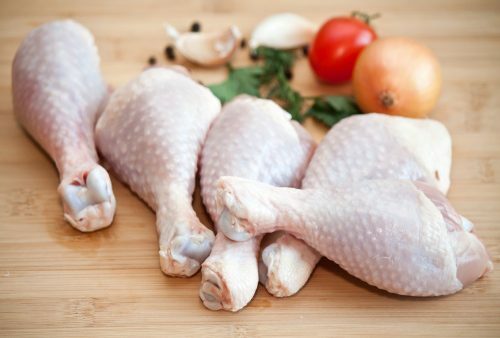 The executive director of Consumer Reports’ food safety center added that handling contaminated raw chicken helps to transfer bacteria to kitchen surfaces, where they can survive for days on end. But the presence of feces on raw chicken is likely to rise in the coming years. The U.S. Department of Agriculture promises to allow poultry plants to process 175 chickens every minute — an increase from today’s maximum of 140, according to Consumer Reports. It may also download food inspection duties to individual companies, which would leave the reporting of unsanitary conditions to poultry company employees, themselves. There is some good news, though. The U.S. government plans to ban antibiotics used to make food animals grow or prevent sickness brought on by unsanitary cage conditions. In the meantime, Americans shouldn’t give up consuming chicken. Although it may not be any safer than other meats, the bacteria found in chicken doesn’t always sicken people either.